Stephen O’Shea’s latest book is an entertaining and enlightening roller-coaster ride through the heights of Europe. 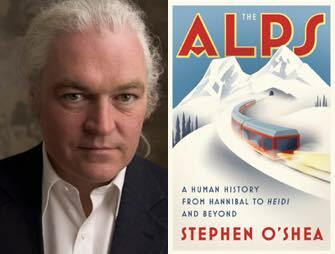 Full disclosure: Stephen O’Shea, author of the recently published The Alps: A Human History from Hannibal to Heidi and Beyond, is a friend of mine. That has nothing to do with the mention of my first name in the subtitle*, but it’s true that I am not a totally unbiased reviewer. I am, in fact, a great fan of the way O’Shea makes serious history and current events entertaining with his smart, colorful writing style. When reading The Perfect Heresy, his book on the history of the Cathars, I read as slowly as possible because I was enjoying it so much that I didn’t want to finish. It reads like a good novel. I will try to be fair, however, in my assessment of his latest book. This is no hill-and-dale tale; more like man against mountain. The Alps takes the author on a road trip through the mighty range that divides Europe in so many ways, cutting it up into parcels that may be geographically close to each other but are disconnected, historically, culturally, gastronomically, and linguistically. These differences are what fascinate O’Shea as he toils up and down the steep slopes on frightening whiplash roads (we get to hear in detail about perhaps too many of them; one hairpin turn is much like another) and crisscrosses back and forth from France to Switzerland to Austria to Germany to Slovenia, all the while battling but never quite conquering his fear of heights. He points out that as perceptions of the mountains changed with the Enlightenment and the approach of the Romantic era, another writer, Mary Shelley, exemplified the new appreciation of these once-terrifying peaks in her novel Frankenstein, or The Modern Prometheus, in which the main character finds peace in the encounter with “sublime and magnificent scenes” in the mountains. Along the road, O’Shea offers us plenty of literary, historical and biographical tidbits. Those 19th-century seekers of the picturesque, for example, often carried with them an item called the Claude Glass (after the artist Claude Lorrain), basically a rearview mirror. “When the intrepid traveler confronted a picturesque vista, he would turn his back to it, whip out his Claude Glass, then manipulate it so that its reflecting surface formed an ephemeral, well-composed painting, leaving out all the extraneous sites that might spoil the effect.” Today’s tourists with their selfie sticks come immediately to mind; the only differences being that now the traveler becomes part of the picturesque vista and the image is permanent. The author’s quirks add a personal touch to this road trip through history and geography. Against character, he is, for example, strangely pleased to be driving a limited-edition Renault “muscle car” arbitrarily assigned to him by a leasing agency, which attracts plenty of attention from car aficionados along the way and even wins him some special favors. It may also have helped him over some of those difficult mountain passes. I can attest that O’Shea is as witty and interesting a travel companion on the page as he is in real life, and I recommend that you join him on this entertaining and enlightening roller-coaster ride through the heights of Europe. * The “Heidi” in the book’s subtitle is a reference to Heidiland, a kitschy theme park in Switzerland beloved of Japanese tourists, which O’Shea visits in the course of the book. The Alps is available from Amazon and other booksellers.